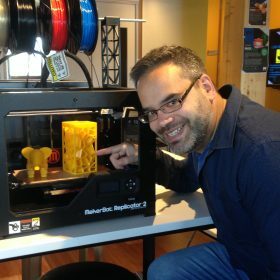 Gil Poznanski is an international leader in the Maker community, inspiring speaker and teacher, and has a proven track record in developing STEM and Maker environments and is excited by the challenge of harnessing technology in new and innovative ways to enable others to create, make and learn. He currently works as the Creative Technologies Activator for the Library at the Dock where he runs the Makerspace, a place where the public can come and learn all about the latest technology and workflows to make their dreams into physical reality. He is an expert in methodology and workflow, something he learned and perfected when he worked aboard in the Hollywood film industry. Nicknamed “The Kosher Tony Stark” by those who he has helped, Gil brings a flair to everything he does, and doesn’t shy away from the big projects.